Odds are not in Councilmember Tony Avella’s favor this September. But, somehow, he stays upbeat. This year’s Democratic mayoral primary could put the City Council’s maverick (I know we are all tired of that word, but truly it suits him) against Comptroller William Thompson Jr. and Rep. Anthony Weiner. Avella, needless to say, is the underdog. Newspapers often disregard his candidacy and focus on other contenders. He is, by far, behind other mayoral candidates in fundraising. And at this morning’s breakfast, the crowd was considerably thin compared to showings for both Weiner and Thompson. Nonetheless, Avella continues to tout his vision for the city — one that includes community based planning, not “knee-jerk” reactions to the city’s developers; an overhaul of how citizens participate in city government; and a platform to bring back manufacturing jobs to the city, thousands of which have picked up and headed for more industry-friendly areas. He says, if re-elected, the Bloomberg administration would cut out community boards from the city’s land use review process. He wants to bolster the neighborhood’s say by ensuring community board drafted plans have the force of law. To save public transportation, Avella doesn’t want to tax drivers commuting from borough to borough (he calls it “discriminatory” ). No, he wants to legalize sports betting to raise revenue for the Metropolitan Transportation Authority. “Maybe, I’ll be the first mayor to give up power,” Avella quipped in his recognizably raspy voice. While committed to the race, (he said he promised voters long ago to only serve eight years) Avella’s poll numbers don’t stack up well against the other big D contenders. A Marist poll released Friday put Avella at 9 percent, Thompson at 30 percent and Weiner at 38 percent, with 23 percent undecided. Avella went down a percentage point from November 2008. Tony Avella may be the underdog, but we’d all be better off if the mainstream candidates were as impassioned as he is about bringing back democracy to what is now a mayor-dominated city government (and a speaker-dominated city council) where on too many important issues the real estate industry calls the tune. The beauty of the poll is that the election is not tomorrow, and Tony Avella is in a prime position to be heard by an increasingly disenchanted electorate. Like most New Yorkers, Mr. Avella is fed up with the status quo in city government, and with the utter lack of ethics in the City Council. Bloomberg’s weekly stunts are doing nothing to help his cause, and make no mistake about it–Bloomberg doesn’t want to hear from you. 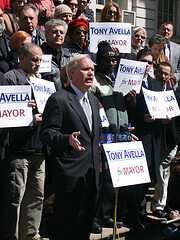 Tony Avella DOES want to hear from you. He has fresh ideas for accountability and accessibility in government–words that you will not associate with the current administration. Tony Avella also does not accept campaign contributions from the real estate industry; he is not beholden. Who else can say that? Bloomberg is on a downward trajectory. Avella doesn’t even rise to the level of ‘underdog’. He’s a vile-tempered, intellectually limited man with very little credibility. Over and over again Avella has has proven that he takes positions without thoroughly researching; his knee-jerk, scattershot, and alienating to approach to just about everything is the very last thing this city needs. Wait and see–Bloomberg is steadily sinking and his childish tantrums (read: refusing to accept extra food stamp money from the federal stimulus plan)will cause a world of pain to real New Yorkers. Stick with Bloomberg, and you will see more jobs lost and more middle-class flight. At the same time, he is announcing his $45 million program of using taxpayer money to retrain bankers who got us into this mess–on Bloomberg’s watch. New Yorkers had better wake up fast and show Bloomberg the door. Avella has my vote, and watch for New York City residents to come to their senses and elect a mayor of the people. Maverick? Whatever. Maybe it only seems that way because people today are so beaten down by do-nothing, sleazy politicians who consider their political posts to be part-time jobs. Try emailing some of the City Council members or other elected officials–you’ll see that they have no intention whatsoever of hearing from constituents. I understand that Councilman Avella introduced a bill in the Council yesterday (2/26/09) that would amend the Administrative Code to repeal the residency requirement for all employees of the City of New York (as contrasted with the recent legislation that only helped DC 37 members). Can we get some information on this?